This entry was posted in Quotations, Terrorism and tagged Bruce Beattie, Colin Powell, terror-industrial complex. Bookmark the permalink. 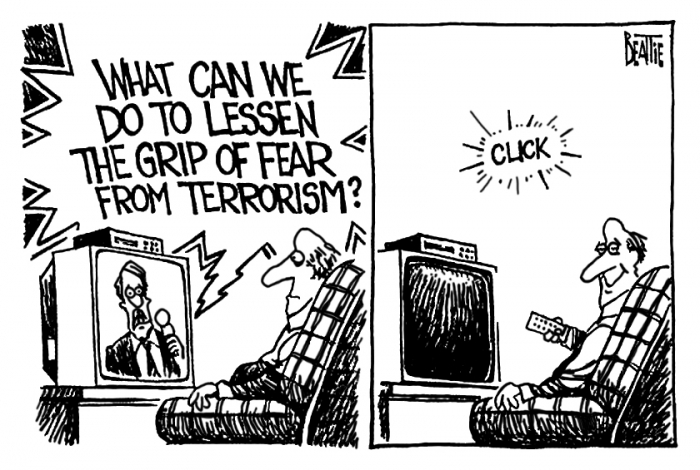 I haven’t watched news on TV since… well, never is probably accurate. And every year, I find more reasons not to start. There are a few good reasons to watch TV “news” (e.g., John Stewart, Steven Colbert, Rachel Maddow) but they are far outnumbered by reasons not to (e.g. all of Fox News, the Sunday network talk shows etc). I don’t blame you a bit, X.
I watch Jon Stewart online on the Comedy Central website, which also has Colbert. And occasionally I see Maddow clips on Youtube. So I’ve pretty much got everything covered.